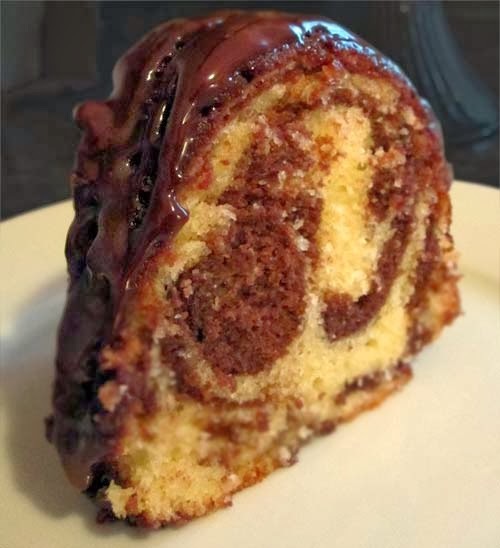 The recipe for this scrumptious marble pound cake is from The Pastry Chef's Baking. The glazing is not as neat as the Pastry Chef's, but the inner marble swirls are pretty close (see pic below). "Make cake; Position rack in center of oven and preheat oven to 325 F. Grease inside of a 10” Bundt pan. Dust pan with flour. Sift together flour, baking powder and salt into medium bowl. Set aside. In a medium bowl, whisk together ½ cup sugar, cocoa powder, and water until smooth; set aside. In bowl of electric mixer, using paddle attachment, beat butter at medium speed until very creamy, about 2 minutes. Gradually beat in remaining 2 cups sugar. Increase speed to medium-high and beat until mixture is well blended and light, about 4 minutes. At medium speed, beat in vanilla, then beat in eggs one at a time, mixing well after each addition and scraping down the sides of the bowl as necessary. At low speed, add dry ingredients in three additions, alternating with milk in two additions and mixing just until blended. Add 3 cups of batter to cocoa mixture and stir until blended. Spoon one-third of remaining plain batter into prepared pan and smooth into an even layer. Spoon one-third of chocolate batter over plain batter and smooth into an even layer. Spoon over another third of plain batter, then another third of chocolate batter, smoothing both layers. Repeat with remaining batters, ending with chocolate batter. Bake cake for 60 to 70 minutes, until cake tester inserted into center comes out clean. Cool cake in pan on wire rack for 15 minutes. Invert cake onto rack and cool completely. 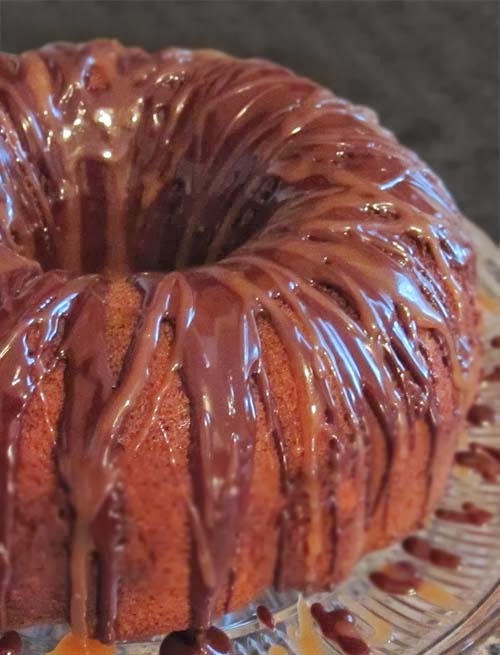 Make glaze: Whisk cocoa and confectioners' sugar. Add milk, 1 tablespoon at a time, whisking smooth, until desired consistency. Pour over lukewarm or cooled cake. See the post on Triple Chocolate Pound Cake for more chocolatey flavored treats.